I realize that many Top Ramen flavors are actually dairy-free – it was probably the first food I ever learned to cook as a child. But those processed packets are far from nutritious. And while my healthy ramen redux isn’t a full mock of those super-cheap instant lunches, the use of onion powder (not fresh onions!) gives it that nostalgic appeal which I sometimes long for. I opted for a sesame vibe, because a) I like sesame – it just shouts “amazing Asian food!” – and b) I just received a beautiful bottle of sesame seeds from Simply Organic. I’m gong to be partnering with them in the future (for my upcoming books! ), and am elated since I’ve been using (and loving) their spices for years! I’ve made this healthy ramen many times before with udon noodles, but the one shown is with Muso Soba Noodles that I received as a gift from Gold Mine Natural Foods. They offer both wheat-buckwheat soba and gluten-free 100% buckwheat soba noodles. And as you can see, this healthy ramen is more of a “dry” noodle dish, which is how I like it. I add just 1 cup of broth to the whole recipe to add moisture for “dipping” the noodles without making it overly soupy. 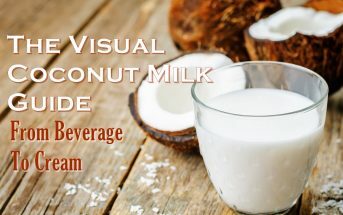 By ingredients, this recipe is dairy-free / non-dairy, egg-free, nut-free, peanut-free, vegan / plant-based, and vegetarian. 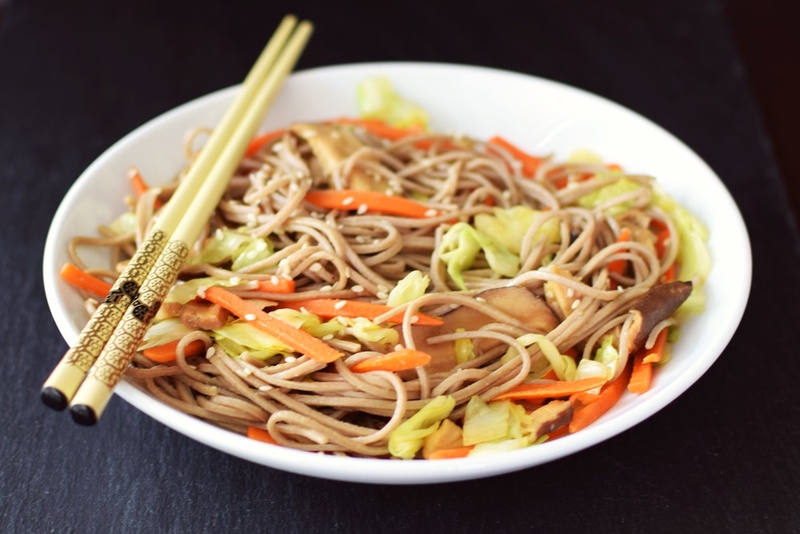 For gluten-free healthy ramen, look for 100% buckwheat soba noodles or use your gluten-free noodle-y pasta of choice. For soy-free healthy ramen, you can use coconut aminos in place of the soy sauce. Note that the flavor may be a touch different, so you may want to adjust the other seasonings, to taste. Higher Protein Option: For a heftier meal, I think this dish goes nicely with cubed tempeh or cooked chicken. Simply saute about 8 ounces with the mushrooms. Superfast Tips: For a meal that is ready as soon as the noodles are done, you can cheat and purchase pre-packaged coleslaw mix for the vegetables, pre-sliced mushrooms, and jarred crushed or mince garlic (1/2 to 1 teaspoon). 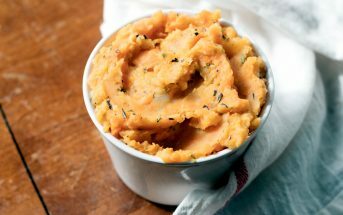 You can also skip the garlic (we often do) or use 1/8 to 1/4 teaspoon garlic powder instead, added with the onion powder. Note that I like my ramen as more of a dry dish with just a touch of broth, but you can omit or add more broth for a full soup, if desired. This makes a nice light meal as is, but for a more filling dish, heed my recommendations in the post above for added protein or simply bulk up the veggies. While the pasta is boiling, heat 2 tablespoons of the sesame oil over medium-low heat (I do a lower heat to protect the flavor of the oil, but you can up it to medium if you are really hungry). Add the carrots and cabbage and saute for a few minutes. Add the garlic and mushrooms and saute just until the mushrooms begin to soften, about 3 to 5 minutes (or just 1 minute if using rehydrated mushrooms). Turn off the heat, and stir in the noodles, soy sauce, remaining 1 tablespoon of sesame oil, and onion powder. Stir to evenly coat the ingredients. Stir in the broth, if using. The broth adds nice moisture without turning the dish into a full soup. Season the noodles to taste with salt (I use around ½ teaspoon, but start with just ⅛ teaspoon and work your way up as the saltiness of your ingredients may vary) and pepper. Serve in big bowls. Can the mushrooms be dropped or do I need to substitute something for them. Mushrooms freak me out. You are too cute Jennifer! The mushrooms definitely have an influence on the flavor, but you can omit them if needed. Maybe add tofu for texture and added protein? This looks SO good, Alisa! Yum! I’ve been on such a noodle kick lately too! I happen to have cabbage, carrots and cooked noodles in my fridge. I think this recipe is calling my name!! when I was a kid at sleep away camp, ramen noodle cups were so popular. I never got into them -they were always too salty for me (guess that was my inner dietitian back then!). Your recipe is a fabulous improvement on the ramen of the past! Oddly enough, I never liked the ramen cups either! Something weird about them – but I the packages were too darn easy to cook at home. Back then (oh my, too long ago) we actually considered them healthy! Yum! This looks SO tasty! Thanks for sharing. Alisa, You’ve done it again! That looks amazing! Oh I love all the flavors in this dish – and all of your suggestions – super helpful 🙂 I haven’t had ramen in so long, this recipe sounds like the perfect way to reintroduce it in my routine!! I woke up with a craving for sesame and this is what I’m going to make for lunch! I have some awesome (gluten-free) buckwheat sweet potato soba noodles at home that I am just dying to cook with! This is such a fabulous Asian dinner dish! Love! Ooh, with sweet potato?! How yummy! 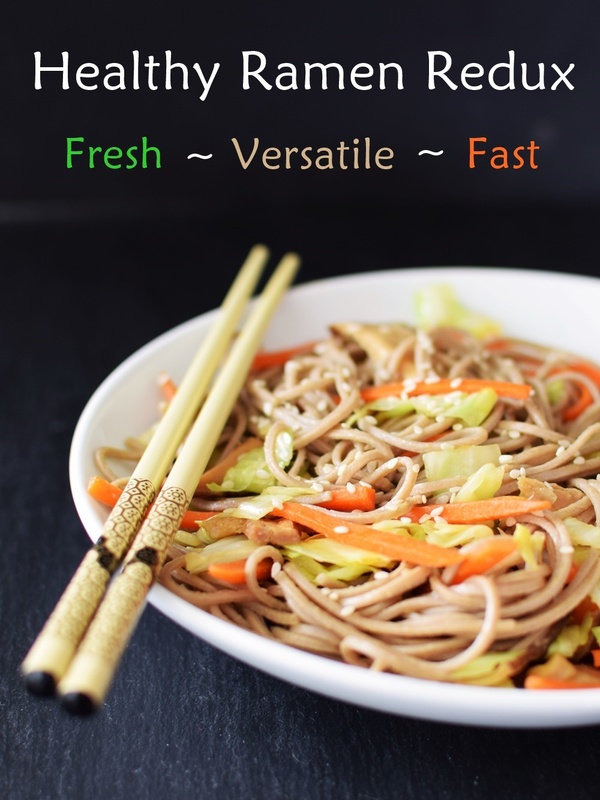 What a healthy recipe, love Soba noodles! I’m always a big fan of soba noodles. I use these often with a tahini sauce. Your recipe give me a new impression what one can do with these. I love all the ingredients to create a unique flavor. Thanks Florian! 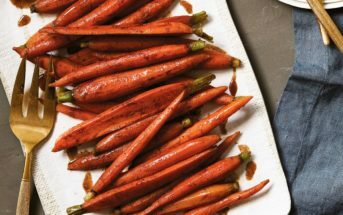 I’m always a little timid with tahini – it adds such bitterness – but have a mild tahini recipe that’s just a little different from this one. I agree, a delicious option, too! Alisa, this looks wonderful, despite all the healthy steps you’ve taken, it looks like take out and bet it tastes just as good. Great job! I totally have a weakness for soba noodles, I love the flavor and texture. Can’t wait to try this! Haha, me too – I’m a total noodle connoisseur! seeing as I’m in the midst of moving, i’ve been cleaning out the pantry and finding a tonne of dried noodles including soba ones- Kicking myself that I didn’t put it to good use earlier! Another winner here Alisa! Thanks Arman and good luck with your move! I just love that WONDERFUL taste of sesame too, especially the oil. this sounds amazing!